On Thursday former Communications Minister Siphiwe Nyanda told the Commission about what he said were rumours that were circulating among ANC National Executive Committee members on an impending Cabinet reshuffle that would affect him in 2010. Before that former Finance Minister Trevor Manuel told the Commission that the extent at which State capture had impacted the daily running of government, needed urgent intervention from the country’s judicial system. 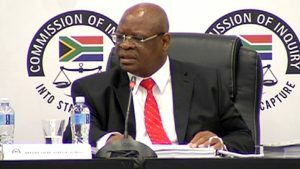 The Commission also heard how emotional ANC head of election Fikile Mbalula was after the Gupta family informed him of his imminent appointment as Sports Minister. Nyanda said this concerned him especially that no one among the ANC top six bothered to take on then President Jacob Zuma on the matter concerning Mbalula. It’s not clear whether Mbalula will heed the call by the Zondo Commission to testify, following the mentioning of his name on Thursday. The post Eskom’s Group Treasurer to take the stand at State Capture Inquiry appeared first on SABC News – Breaking news, special reports, world, business, sport coverage of all South African current events. Africa's news leader..